Hillary Clinton on June 13 announced the official launch of her campaign for the 2016 presidential election. But wait … Didn’t she make an official announcement on April 12 that she was running? Clinton explains that her earlier launch was just a “ramp-up” phase, and most of the mainstream media are dutifully reporting it that way, despite the hoopla surrounding the much-anticipated launch on April 12. Not everyone is buying it, though. So which chart are we going to use? And which chart were we using in the first place? Her campaign Web site came online just after 3 p.m. on April 12. However, her campaign manager, John Podesta, sent an e-mail to supporters at 2:33 saying her candidacy was official, and it was immediately reposted on Twitter by one of the recipients. The media got the word days earlier in a press release, complete with a launch schedule with the announcement at noon. The Guardian, attributing the information to an unnamed source, didn’t wait and published the story on April 10. Or what about the chart for when she filed the official paperwork declaring her candidacy or signed the lease on her campaign headquarters in Brooklyn? What is it with Hillary Clinton? Her birth time itself is mired in uncertainty, resulting in a Rodden rating of DD. Astrologers have pondered and debated her birth time for years in an attempt to cast accurate election charts and to gain insight into her personality. Ironically, the confusion serves to reinforce the most probable birth time of around 8 a.m., which places her Scorpio Sun in the secretive twelfth house. Clinton admitted an identity problem in her first “official” campaign launch, quipping that she was “the most famous person you don’t really know.” That left her open to harsh criticism, among the most devastating being that her nomination was more like a coronation, with a sense of entitlement. 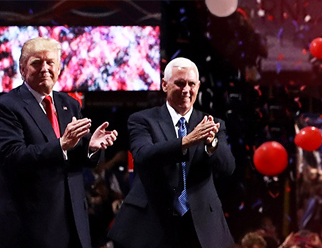 The re-launch has been described more as a “re-branding,” following a two-month trial during which campaign advisors had an opportunity to evaluate their strategies to portray the former first lady and secretary of state as more approachable and down-to-earth. In past elections, she came off as aloof and detached. One gets the feeling that she’s trying too hard to be whatever will appeal to voters, or at least what her advisors are telling her will make her more likeable. Just a coincidence? Or is it a twelfth-house thing? On her Twitter account, Clinton describes herself as “wife, mom, grandma, women+kids advocate, FLOTUS, Senator, SecState, hair icon, pantsuit aficionado, 2016 presidential candidate.” One gets the feeling that she’s trying too hard to be whatever will appeal to voters, or at least what her advisors are telling her will make her more likeable. It’s like the old joke about putting a chameleon on plaid. And her Pisces Moon is the consummate chameleon. 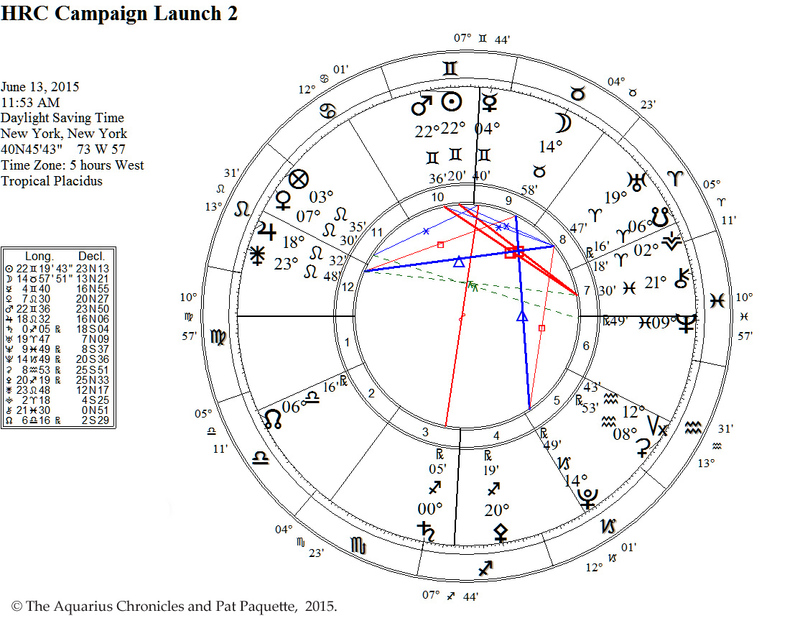 From an astrological viewpoint, the re-launch chart is more favorable for getting a message out. 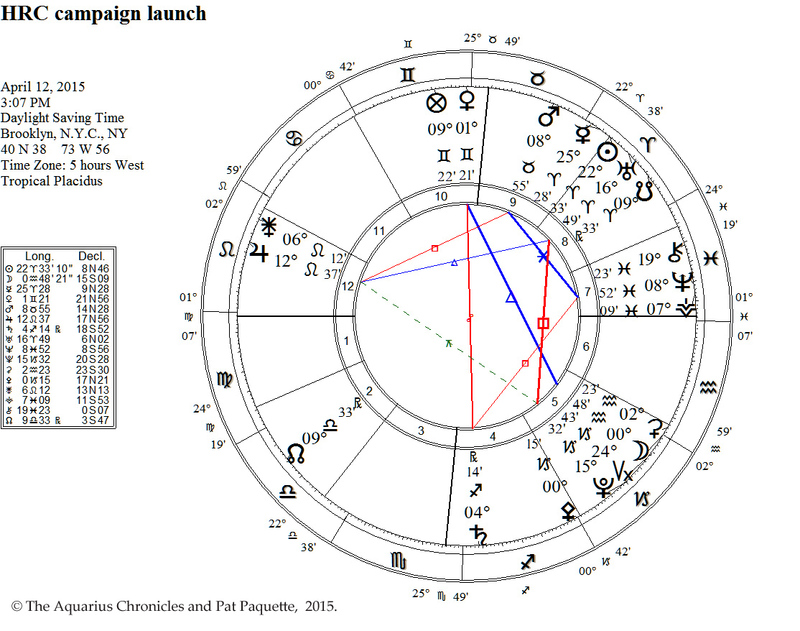 Although both “official launch” charts have Virgo Rising, the June 13 chart has Mercury in Gemini conjunct the Midheaven, with a partile Sun-Mars conjunction in Gemini in the tenth house. Another coincidence? Or did her campaign wise up and hire an astrologer? Image: Former Secretary of State Hillary Clinton gives a speech in Washington, D.C., November 2012. Photo credit: U.S. Department of State.